Pages for iPad is a full featured word processor developed by Apple Inc. that is a must have app for all your mobile productivity document viewing and editing tasks on the iPad that sells for $9.99 in the App Store. The mobile version of Pages has been fully redesigned to take advantage of the iPad’s touch screen and large sharp screen. Featuring a full QWERTY on-screen keyboard and multi-touch gestures, you’ll be able to create all sorts of productive and fun documents on your iPad including letters, reports, brochures and more using 16 great looking templates designed by Apple. Pages has native iPad support for picture attachments and full integration with other iPad apps like Numbers and Keynote for inserting charts and graphs into your files. 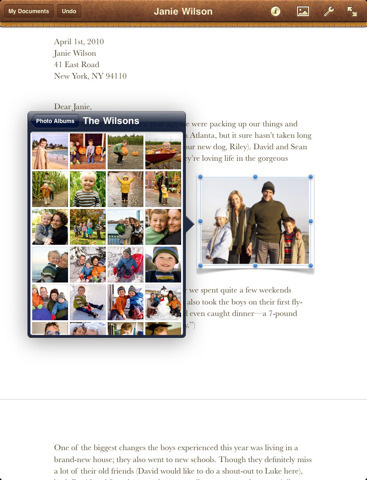 Photos you have on your iPad can also be easily used in your documents whether they are in your Photos app, or in email attachments or from online resources. You’re able to adjust fonts, text styles and custom tailor your writings with full formatting features such as tabs, indents, margins, tables, columns and more. 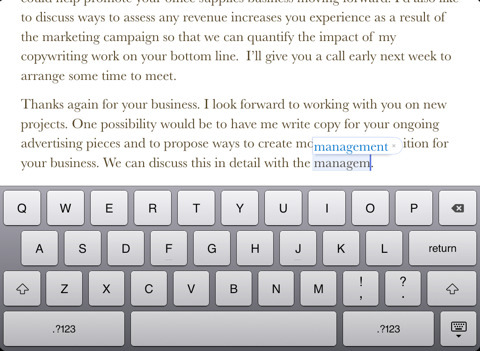 Pages fixes spelling and punctuations as you type and automatically formats your lists for you. To export your Pages files form your iPad you can either email them to yourself or anyone else. You can also sync your files with your computer and get access to your files using the new iTunes File Sharing feature. Finally if you have iWork public beta access you can get to your files that way as well. Files can be exported to work with Microsoft Word, or PDF as well as the Pages format. AppSafari review of Pages was written by Joe Seifi on April 1st, 2010 and categorized under App Store, Featured, iPad apps, Notes, Productivity, Utilities. Page viewed 4620 times, 1 so far today. Need help on using these apps? Please read the Help Page.